Wind, clouds, and nightfall. Not the usual descriptors for perfect photographic conditions, but in the right circumstances, these conditions can produce dramatic images. 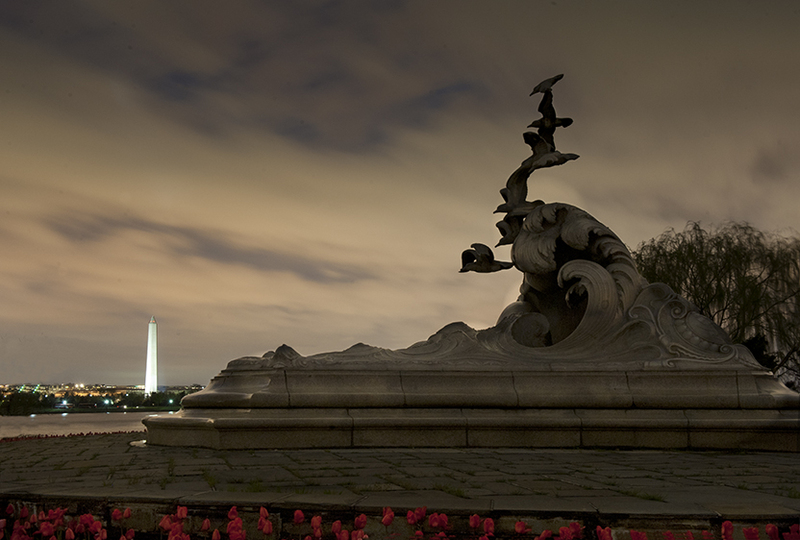 As suggested in my last post, the Navy and Merchant Marine Memorial seemed to have potential for nighttime photography. And so, here are a few examples of my first attempts. As the evening clouds began to build, it became apparent that some interesting weather was heading in from the west. The image above was taken about 15 minutes after sunset, and still in the twilight period. (Technical data: Nikon D700 with 24-70mm f/2.8 lens on tripod; Lens extended to 44 mm; Exposure: 4 secs. @ f/16, ISO 200). 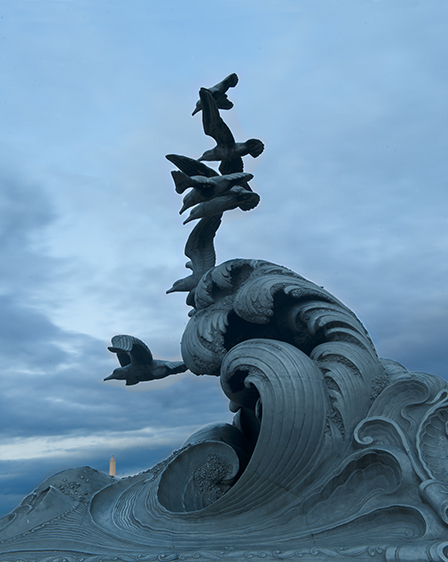 The sculpture’s seven gulls skimming the cresting wave provided a counterpoint to the storm front that seemed to be moving in. I decided to take my chances and stay. My favorite time to shoot is what many photographers called Magic Hour (see my previous post here for more information on that subject) and here, the perfect moment was reached around 30 minutes after sunset. I worked quickly to take 4 time exposures that would be assembled later into the single image above. (Technical data: Nikon D700 with 24-70mm f/2.8 lens on tripod; Lens at 24 mm; Exposure: four ranging from 15 to 30 sec. all at f/16, ISO 400) The clouds were growing more dramatic and although darkness was coming, I decided to ignore my usual practice of leaving at the end of twilight. 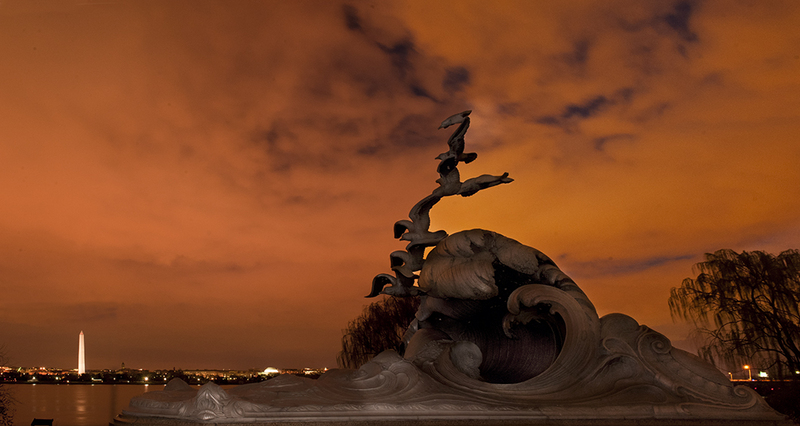 This memorial is not illuminated by installed artificial lighting, there is only ambient light after the sun goes down. But even at the 40 -minute mark, the ambient light was pretty good and I was helped by the city lights across the river bouncing off the relatively low cloud cover. Boosting the ISO to 1600 made it possible to continue shooting. (Technical data: Nikon D700 with 24-70mm f/2.8 lens on tripod; Lens at 24 mm; Exposure: 8 sec. @ f/16, ISO 1600) I noticed, however, that the sky was beginning to take on an unusual tint. Perhaps just a few more minutes, I thought. I’m not exactly sure what was going on, but as the color of the clouds became increasingly bizarre, my camera was telling me that it was also getting brighter. The orange color above is an accurate representation of what I was seeing. (Technical data: Nikon D700 with 24-70mm f/2.8 lens on tripod; Lens at 24 mm; Exposure: EV-1, 2.5sec. @ f/16, ISO 1600) It was now a little more than 45 minutes after sunset, and the wind was picking up. Standing there alone in near-total darkness, the sound of the wind and strange colors in the sky also imparted an ominous sensation. But then I realized that the planes departing Washington Reagan Airport, just a few miles away, were now flying directly overhead. This provided yet another opportunity so I decided to stay a few more minutes and attempt to get lucky with the take-off patterns. I decided that no one would believe that the sky was really this orange color, so I changed the White Balance from Automatic to Tungsten. I always shoot in RAW, so any corrections that might be needed would be relatively easy during the post-processing. As it turned out, the result above is pretty much the way it came out. It looks like a normal night scene, but those are not the colors I was seeing. 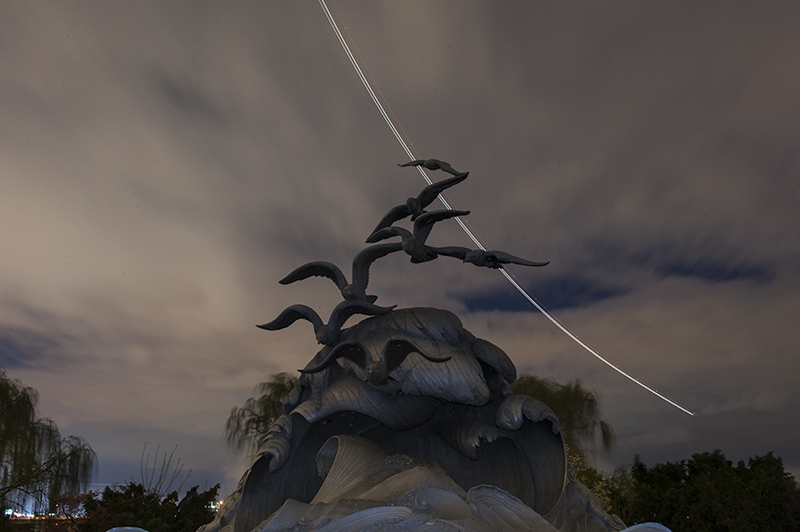 The above image was taken 55 minutes after sunset. (Technical data: Nikon D700 with 24-70mm f/2.8 lens on tripod; Lens at 28 mm; Exposure: EV-1, 15sec. @ f/16, ISO 400) At last, I decided I should quit while I was ahead and close up for the night. It had not started to rain yet, and I didn’t want to press my luck. 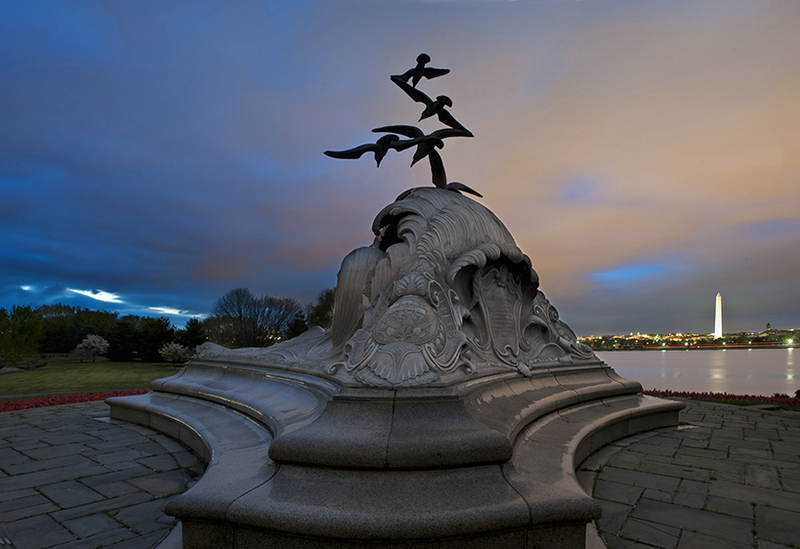 This entry was posted in Magic Hour, Washington DC and tagged Location Tips, Magic Hour, Navy and Merchant Marine Memorial, Night, Nikon, Photography, Technique, Tips, Washington DC by Robin S. Kent. Bookmark the permalink. Great set of images, just shows the difference an hour can make! My favourite would be the second one, I like the bold silhouette of the gulls against the sky. Thanks, Katie for the nice words. Yes, that was also my favorite one from the evening. I appreciate your checking out the post. Thanks, Pat. Good to hear from you. That’s right, a whole new group of photographers is being formed. Glad to hear it’s going well. Things are getting back to normal here and I should be back on a regular shooting schedule soon. Excellent group of photographs, I really love the composition on them (first one is perhaps my favourite). I keep coming back to this post so thank you very much for including all the technicalities! Thanks very much for your comments, I appreciate the feedback. I’m glad the shooting data was helpful. I’ll try to include that more consistently in future posts. I don’t think I can pick a favorite: each one is different from the other. It is hard to believe they could be taken in such a short time period. Love them all! Thanks very much for your comments. Yes, it was an unusual evening. I don’t normally see such changes like that. I thought the second way my favorite … until I got to the third, and then I got to the fourth, and finally to the fifth. No way can I pick a favorite. They are all stunning! The clarity, the colors, the capture of the jet stream, the illuminated Washington Monument in the distance. You do DC proud, Robin! Thanks, Stacy: That’s so kind of you to say. Wow. Amazing colors and beautiful captures 🙂 Lovely post! Thank you very much. I appreciate that you took the time to comment. Great work, I think I like the second image best, the composition is the deciding factor – the way the statue almost cuts with the line of the colours, helps to give it impact. Your notes, and blog discussion is, I am sure very useful to many who need that encouragement to go out there and try some low light photography themselves. I applaud your commentary as well as your images, thanks for sharing. Thanks very much for detailed comments. your feedback. I appreciate the your feedback, especially since you also do very nice evening photography. Yes, I agree that folks who haven’t tried twilight photography should try it. Add a tripod and they are good to go.